Husband and wife team Charles and Ray Eames came to film from architecture, design and painting backgrounds. Ray in particular was noted for her commitment to the European Modern approach to Information Design (1). Indeed, students in those fields may be more familiar with their work than their peers studying film. Certainly, the influence of these related fields is evident throughout A Communications Primer (1953). This documentary utilises simple shapes and expository action sequences in order to explain the basics of contemporaneous communications theory and is the forerunner to over 100 more films including House: After Five Years of living (1955), Toccata for Toy Trains (1957), View from the People Wall, Franklin and Jefferson Proposal Film (1973) and Art Game (1978). The interests of the Eames are many and varied, although their approach to any subject matter is consistently contained within one central motif: complex ideas can and should be made simple. This ethos extends to their work in other fields, and was articulated in the most appropriate manner for post-World War II artists, through a reduction to component parts followed by abstraction. 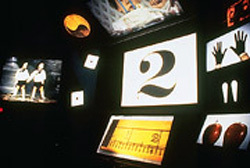 According to Richard Hollis, Charles’ film work developed out of his experience with multiple-screen slide shows which themselves combined animation, diagrams, still images and action sequences. (2) Ray’s influence is apparent throughout: the techniques of abstract art – cut-outs and superimposed photographs, for example – are assembled into patterns that experiment with repetition and scale. This signature aesthetic crosses the broad range of her design activities. A Communications Primer is unapologetically optimistic in outlook, implying that the technological innovations of the mid-twentieth century, and associated theories, have the capacity to improve the human condition, based as they are on the neutrality of binaries. It is thus the responsibility of designers to understand themselves, and deliver in an accessible but meaningful form the bases upon which communications rest. In the case of textiles, this means the reduction of complex images to their simple component shapes, rendering, for example, a white fabric with large blue or red dots repeated across it in a manner conducive to symmetry. In telegraphy, it is the accurate operation of the on/off switch. As such, communication is discussed in terms analogous to the electronic achievements that eventually signaled the shift from analogue to digital. The digital mode is then extrapolated in an effort to depict speech and writing as early forms of modern technology. The film begins with a photographic negative of a dictionary page, providing the viewer with definitions of key terms, and ends with action sequences of movement along telegraph wires, signal tower operators carrying out their duties and a pilot operating the radar unit of his aeroplane. The Eames thus celebrate the potential of the modern age, withthe caveat that humans are ultimately responsible for the actions performed by machines. A Communications Primer also expresses a sense of relief about the clarity afforded by behavioural psychology and its extension through to models of information design where communication is conceptualised straightforwardly in terms of the Sender and Receiver. Although this approach has useful applications, particularly with respect to later developments in media theory (such as the Hypodermic model), its flaw lies in its equation of simplicity with truth. Miscommunication is thus understood to be a result of “noise” (represented by pink and yellow asterisks appearing on a black background) or cultural divergence between Sender and Receiver. The efficacy of this extrapolation relies, then, not only on the premise that speech and writing are precursors to telegraphy and transmission but that all humans wish to communicate as clearly and effectively as possible. So much for poetry, metaphor and irony! But this attitude is hardly surprising given the Eames’ favouring of minimalism in their commercial art practice, examples of which are prominent throughout House: After Five Years of Living. As seen in the variety of home furnishings and the very structure of the house itself, this emphasis upon simple, abstracted shapes repeated in grid-like formations bestows upon each work a symmetrical (read logical) organising principle (3). Combined with Elmer Bernstein’s modernist score and a good eye for colour, this visual metaphor for sophisticated simplicity is maintained for the duration of A Communications Primer. Schematic diagrams and simple associations serve to highlight the message: clear communication betters humanity. The film is thus an accomplished work of design as well as being a beautifully composed documentary that brings an artist’s feel for colour and composition to the moving image, ensuring visual delight despite theoretical archaism. View from the People Wall builds on that same optimistic enthusiam for contemporary innovations. This may be partly attributable to its use as a promotional tool for IBM at the 1964–65 New York World’s Fair (where it was presented as the multi-screen Think), but given the Eames’ predilections it would seem to express their own enthusiasm too. It packs a lot of information into its 12-minute running time, most of which stresses the inextricable relationship between binary codes as abstractions and as analogous to brain processes. Accordingly, it presents a convincing, if limited, argument for that connection. View from the People Wall tells us that all decisions are based on a mixture of isolated and cumulative choices between “Yes” and “No”, “On” and “Off”. Again, more recent communications theory would challenge that notion on the basis that complex or sophisticated responses to phenomena (the Eames depict a child sniffing a flower to illustrate this) are not necessarily reducible to single or distinct impulses. The film is beautifully rendered, using a multiply split-screen throughout that is put to better use than in many later examples of the same technique (4). Through a descriptive clarity aided by Charles’ own voice-over narration, A Communications Primer and View from the People Wall serve to enrich our experience of high modernism in film. The very same clarity forms much of the basis for the inevitable critiques that have arisen through postmodern and post-structural approaches to theory. The films themselves, then, raise some interesting issues concerning the modernist formulation of aesthetic beauty as an achievement of the resolution between form, function and content; for we are provided with a visually rich experience that leads us to question the very premises upon which that experience is based. Richard Hollis, Design: A Concise History, Kegan Paul, London, 1994, p. 121. Much attention in this film is devoted to the “naturism” underlying the Eames’ work practice. Natural phenomena are captured, simplified and reproduced in materials appropriate to the built environment. The use of split-screen in The Thomas Crown Affair (Norman Jewison, 1968), for example, seems lazy and dull by comparison.